Our costume historians have pored over the books, and used the great search engines day and night to perfect the various formulas for creating the greatest costumes for every era of humanity. The one that was the easiest? Totally the eighties. Like, how can that rocking era be soooo difficult to do? It was the height of great things like neon colors, bleached jeans, and fantastic dance number movies! Even the majesty of the mullet graced this unworthy world with its splendor during this period. You heard us right, the king of all hairstyles was invented by the people of the time. Our best advice to you for your perfect eighties costume? Accessorize yourself into the ground! You should start with these fantastic white shutter shades. Slap them on your face and be ready to dance the night away. 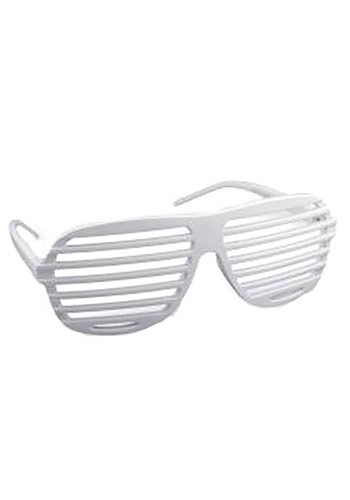 Sure Kanye West loves wearing these things, but don’t let that discourage you from bringing back the good name these babies had back in the day!